The years between 1880 and 1920 changed American cities completely: From elevators to air conditioning to electricity, the monumental buildings born during this period seemed like living things, humming with life. But as quickly as they rose, many of them were torn down—victims of the same progress that pushed them up. "After World War II," NPR once put it, "such buildings fell like leaves in autumn to make space for a new way of life." These buildings—many of which represented first-of-their-kind technical achievements just years before—were woefully outdated for the post-War city, where telephones and open plan offices reigned. They had to go—and in an era before historic preservation even had a proper name, there were very few people fighting for them. A recent New York Times article on demolition in the city—and all cities—called them "belles of the wrecking ball." We dug through the internet, from Skyscraper City to Flavorwire's own, to collection just a few below. But are there other stories of untimely architectural demise floating around out there? Let us know in the comments. We have the Burj Khalifa, but in 1908, the world had the 612-foot-high Singer Building—built by the eponymous sewing machine conglomerate. The tallest building in the world for a time, the downtown landmark was a victim of the great corporate migration towards midtown—in 1968, when modern tenants found themselves ill-served by its awkward, antiquated floor plan, it became the tallest building to ever be dismantled in NYC. Dankmar Adler and Louis Sullivan had a brilliant, tumultuous relationship—and a portfolio of work that made Chicago a landmark of early modern architecture. And the Garrick Theater—aka the Schiller Building—was the high-tech cherry on the top: The massive theater opened in 1892, a year before Chicago hosted the World's Fair. But by the 1950s, a long decline had landed it on the list for razing. A young preservationist and photographer, Richard Nickel, documented its destruction and salvaged pieces of its facade and interior after the wrecking ball had swung in 1960 (one piece even fronts Second City's comedy theater). Images: The Richard Nickel Committee and Archive/Dwell. Today, Nickel is hailed as a founding hero of historic preservation—and one of the only sources of documentation of Adler & Sullivan's demolished masterpieces. Tragically, he was killed while salvaging artifacts from another razed Sullivan building. Built at the end of the Victorian era, this railway station was like a temple to the train: Modeled after Istanbul's Hagia Sophia, its Byzantine spires raised eyebrows when it opened in 1909. Another victim of the decline of the railways, local advocates attempted to save it—but it was demolished in 1969. Maybe it wasn't particularly beautiful, but the Astor House was one of those buildings that practically meant New York to the rest of the country: Built by the self-made millionaire John Jacob Astor and the esteemed architect Isaiah Rogers, it opened in 1836 boasting everything from gas lighting—then a rarity—to indoor plumbing. But like so many other great building of New York, only 70-odd years later, it had become relatives. Everything in the hotel was sold off, and the building was demolished. Image via The Bowery Boys. Described as "the most beautiful railroad building west of New York," by the The Pittsburgh Post-Gazette, and "the greatest Beaux-Arts skyscraper in the city" by others, the grand Wabash terminal only lasted from 1904 until 1954—it was partially destroyed after two fires made it virtually unusable. Penn Station, of course, is the big one: The demolition that united concerned citizens and architects to create the movement that we, today, know as historic preservation. 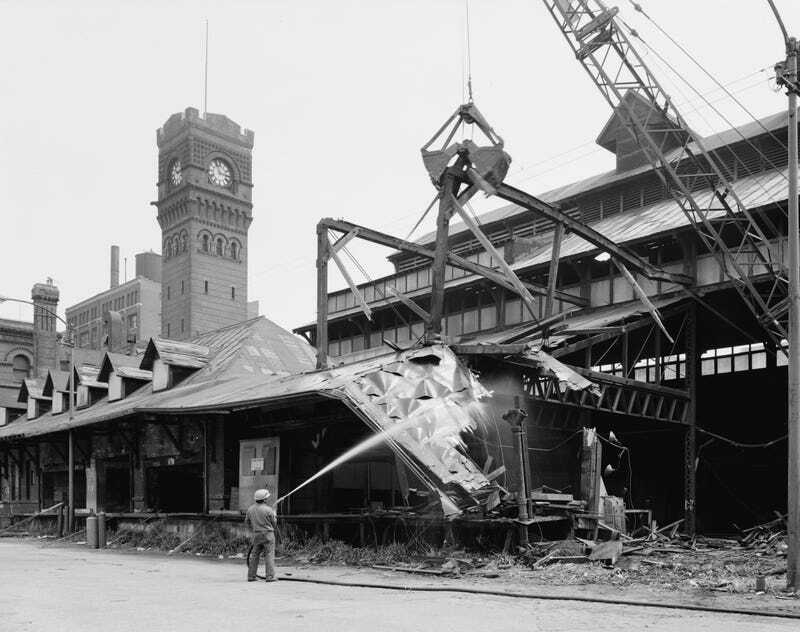 Unfortunately, New Yorkers couldn't stop the wrecking ball from coming down on the original station, a grand Beaux-Arts structure designed by McKim, Mead, and White in 1910, was torn down in 1963. Demolition Images: Boston Public Library on Flickr. Opened in 1905, this hulking Chicago building housed everything from Federal courts to the post office. But by 1965, it had lingered long past its useful life—and it, too, was razed. Mullett's second contribution to this list is the City Hall Post Office, built in 1905 near City Hall in lower Manhattan. It, too, was widely hated by the public (some called it Mullett's Monstrosity), partially due to a construction accident that killed three workers earlier on. It did claim some cool bells and whistles though, like a pneumatic mail delivery system. Alas, nothing could repair its reputation with the public, and it was razed in 1939. Lead image: The train shed of Chicago's Dearborn Station being torn down. Is there a building in your city or town that met an untimely end? Drop it in the comments below!